The Indian poet M. Das has been dead for seven years when news of a new epic poem in honour of Kali, the Hindu goddess of destruction, seemingly written by him, reaches Robert Luczak in New Hampshire. 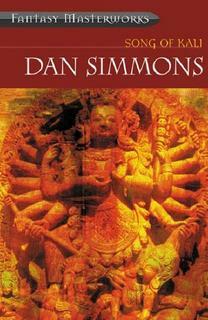 Dan Simmons first novel, Song Of Kali won the 1986 World Fantasy Award. The kindest thing that can probably be said in this regard is that it was not up against very stiff opposition. Song Of Kali does not work on a number of levels. Simmons' invocation of the miasmic life of Calcutta may be accused of demonstrating a residual racism, but on another level his rendering of Indian street life is pungent and striking. The enduring existence and shadowy presence in the novel of an evil goddess reincarnated by her peers to assist them in former struggles is not unduly troubling in light of the genre expectations one brings to the novel, and the coincidental reanimation of the poet M. Das by her followers and Luczak's encounters with him are its highlights. The problem resides in the way in which the protagonist's east coast American lifestyle orbits around rather than interpolates itself within the plot. He is an unconvincing as an expert on the literature of the Subcontinent, and the reader is left with little clue as to how he met his Indian wife Amrita, making her appear simply as a means of reinforcing the character's credentials in the eyes of the reader. Luczak is an unwieldy hybrid character, part urbane academic, part 'hard boiled' pulp fiction hero, and seems to be acting both parts. In addition, the fact that you know that something unpleasant is going to happen to the Luczaks' gurgling, bouncing baby Victoria from the instant she is described casts a pall over the entire experience of reading the book. An unsatisfyingly indeterminate read, and a weak entry in the Fantasy Masterworks series. As much as I am a fan of Dan Simmons, I have to agree with this review. I found the story to be rather depressing and predictable, and the resolution unsatisfying. Not a good indication of the great things that were to come from Simmons.